Christ is not just going to fix our spirits. He’s going to fix our bodies. (Does your body need fixing? Does your mind need fixing?) He’s not just going to fix individuals, he’s going to fix the society of human beings, our relationships and our work and our recreation and arts and culture. And he’s not just going to fix society, he’s going to fix the earth itself–nature and forests and the animal kingdom, all of it. God’s redemptive plan is far bigger than we have imagined. Some time ago we talked about death and the place Christians go when we die, which theologians call the intermediate heaven. This is before the return of Christ, and before the resurrection of our bodies, before the curse is lifted from this present world. Second, there is the place we will live after the return of Christ, after the resurrection: the eternal Heaven, which is called the New Earth. “Behold, I will create new heavens and a new earth” (Isaiah 65:17). “‘As the new heavens and the new earth that I make will endure before me,’ declares the Lord, ‘so will your name and descendants endure’“ (Isaiah 66:22). “Then I saw a new heaven and a new earth....I saw the Holy City, the new Jerusalem, coming down out of heaven from God....And I heard a loud voice from the throne saying, ‘Now the dwelling of God is with men, and he will live with them. They will be his people, and God himself will be with them and be their God’“ (Revelation 21:1-3). Are you looking forward to that new physical universe, characterized by righteousness? This verse assumes we’re looking forward to that—naturally, we would be. Yet many of us never think about it! So God’s ultimate plan is not to destroy us or destroy the Earth, but to renew us and renew the Earth. Cyprian said this in AD 250: Let us greet the day which assigns each of us to his own home, which snatches us from this place and sets us free from the snares of the world, and restores us to Paradise and the kingdom. Anyone who has been in foreign lands longs to return to his own native land....We regard Paradise as our native land. God has built into us a nostalgia for the world that once was, before sin and curse and death and suffering. We are homesick for Eden, for its beauties and pleasures and health and vibrant relationships. The Bible says our citizenship is in Heaven, that Heaven is our home. It’s paradoxical, isn’t it? Our home is a place we’ve never been. We live in a land in between Eden and the New Earth. When the Bible says we sinned in Adam, it suggests we have an essential connection back to the Garden, to Paradise. In a sense, the memories of Eden are built into us, and that’s why we can’t be fully content with anything less. The reason we want to live on an ideal Earth is that we were made to live on an ideal Earth. The reason we long to have enriching relationships with people is that we were made to have them. We didn’t make up this idea, God did. We were made to know joy...yet we end up desperately searching for joy in all the wrong places, and finding instead addictions and hollowness and misery. Consider again these amazing words about the relocation of God’s central dwelling place: “Then I saw a new heaven and a new earth. . . . I saw the Holy City, the new Jerusalem, coming down out of heaven from God. . . . And I heard a loud voice from the throne saying, “Now the dwelling of God is with men, and he will live with them. They will be his people, and God himself will be with them and be their God” (Revelation 21:1-3). We will be with Him, resurrected people living with the resurrected Christ. Physically resurrected people need a physical place to live. That physical place will be the New Earth. Think about what this means. 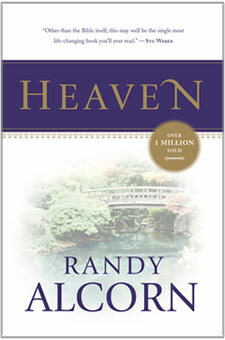 Often we think of Heaven as our going up into an angelic realm to live with God in his place. But in fact, the Bible says the ultimate Heaven, will be God coming down from His place to live with us in our place—the New Earth. That’s the place He’s making for us. Christ’s name Immanuel does not mean “us with God.” Immanuel means “God with us.” Where will He be with us? On the New Earth. The Bible is never content with a disembodied state. That fits with Platonism and Eastern Mysticism, but it does not fit with Christianity. 1 Corinthians 15 says if there is no resurrection, we are of all men most to be pitied. What IS a New Earth? Not a difficult question. New is the adjective that modifies the noun EARTH. A new earth is an earth that is made new, or an earth that is renewed. A new car is still a car. A new year is still a year. A new body is still a body. A new Earth is still an Earth. We become new people in Christ, but we are the same old people made new. (When I came to Christ as a highschooler I was a new person but my Mom still knew I was her son, and my dog didn’t growl at me.) It is really we who have been and will be changed. It is really the earth that will be changed and made new. God’s plan for righteous men and women to rule the earth for God’s glory has never been revoked. Let’s never fall for the devil’s lie that the physical universe is evil—God is the one who created it, who made us to live in it and desires us to rule over it forever for His glory! He will not annihilate the universe, He will reverse the curse and refashion the universe to His glory. The Carpenter from Nazareth is a builder of worlds and a repairer of worlds. Both we and the Earth are in desperate need of repair. And that is His promise. Everything that is broken, including us, He will fix. Randy speaking at Good Shepherd Community Church on the subject of Heaven.